The warehouse in Brakel, NL is a modern inspection facility with a covered surface area of 2.500 m². Our average stock level is about 3.0 Mio. square meters of veneer. The extensive stock has an average of high quality veneers which enables us to offer our clients consistency in supply in the quality and quantity they need. In order to keep sufficient stock and anticipate the ever changing demands of our customers we continuously extend our assortment and stock level. Besides the standard thicknesses, we do also have a range of special thicknesses of 1mm, 1.5mm and 2.5mm. Since 2009, we have been FSC® certified. 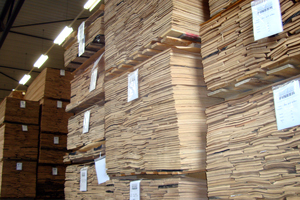 The vast majority of our current stock consists of certified wood. 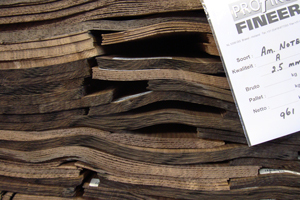 Profiko Fineer B.V. is FSC® certified under no. 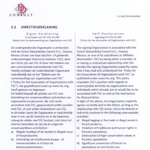 : SCS-COC-000652-JF and SCS-CW-000652-JF for FSC Controlled Wood. 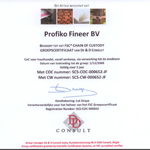 Risk Assessments for FSC Controlled Wood can also be obtained by sending Profiko Fineer B.V. a request.